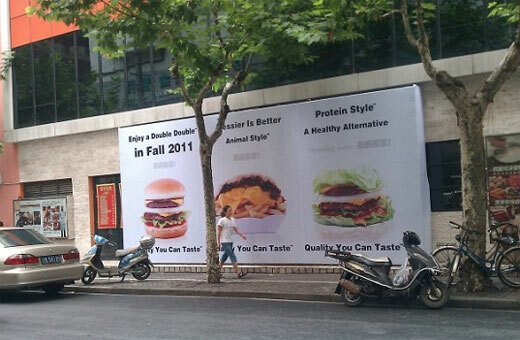 There’s no American fast food chain that China won’t rip off — and always in surreal fashion. Ever since I did my list of 11 Amazing Fake Harry Potter Books Written In China I’ve wanted to do another list on China’s knockoff industry. This week, I finally found enough good fake fast food restaurants to make this list. It’s just coincidence that I’m posting it during Chinese New Year. It’s actually a really good thing this is a fake. 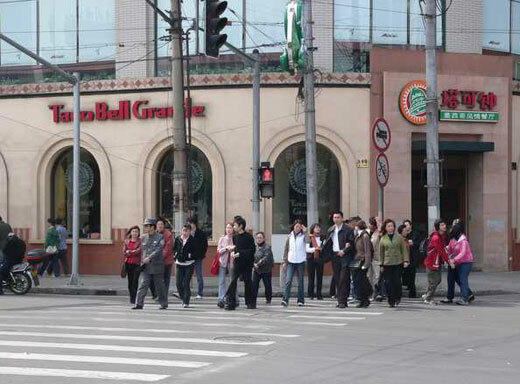 How pissed would every American east of Arizona be if China got an In-N-Out before they did? 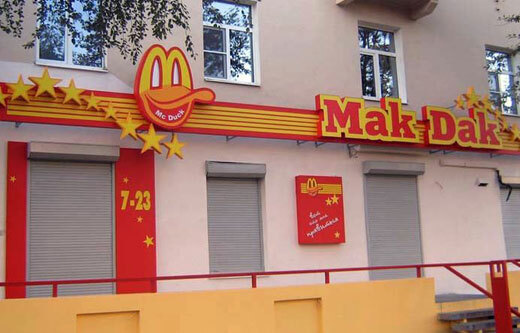 It’s the Burger King logo, but can you really reduce that restaurant to just cheeseburgers? 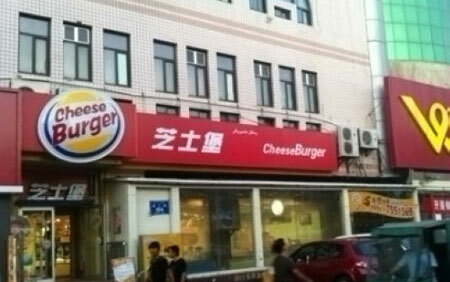 They put cheese on a hell of a lot more things than just burgers, my Chinese friends. 3 | Well this is just offensive! 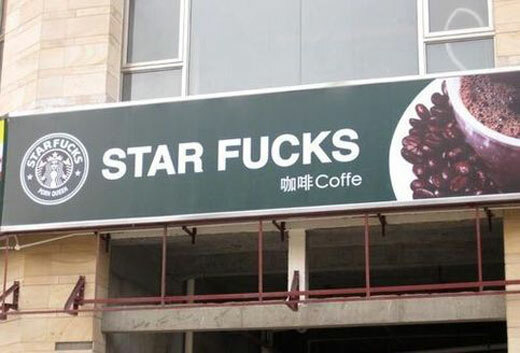 I can’t believe they had the audacity to spell “coffee” wrong. 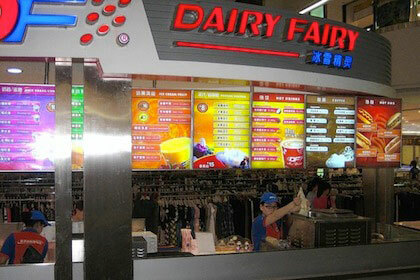 Based on the looks of that menu, I like how the fake Dairy Queen is also accompained by a fake Orange Julius. I guess they couldn’t put it on the marquee because under their “Dairy Fairy” naming conventions they’d need a rhyme with “Orange.” And as everyone who’s ever read a trivia fact off a popsicle stick knows, there’s no word in the English language that rhymes with orange. 6 | It’s a ripoff mashup! This is one of those classic Chinese knockoffs that just jams together two popular logos to see what comes out — like a picture of Mickey Mouse on a shirt with the word “Reebok” under it or something. Here we’ve got the Apple logo stuck in between the 7-Eleven stripes. 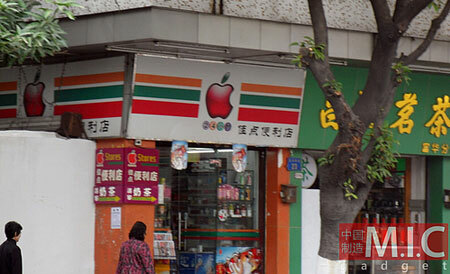 With all the reports of fake Apple Stores in China, maybe they were trying to rip off those ripoffs? I got conflicting reports, but this one might actually be sanctioned by Taco Bell. I’m skeptical, though, because it’s called “Taco Bell Grande,” the bell logo looks nothing like the real logo, and the menu consists of items like ox tail soup. Most damning of all? This place looks far too upscale to be an actual Taco Bell. This fake Pizza Huh exists in a country where people have come up with a way to build a special, three-foot food tower out of cucumbers and carrots so they can maximize the one-trip-only rules at actual Pizza Hut buffets. 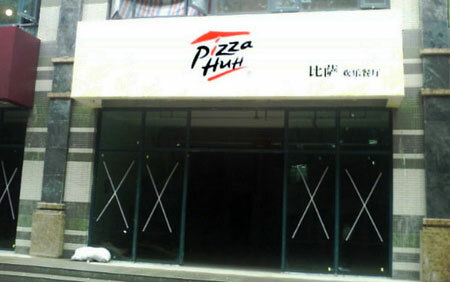 Perhaps now the Pizza Huh business is actually more profitable. 10 | I mean… this has to be considered racist, right? 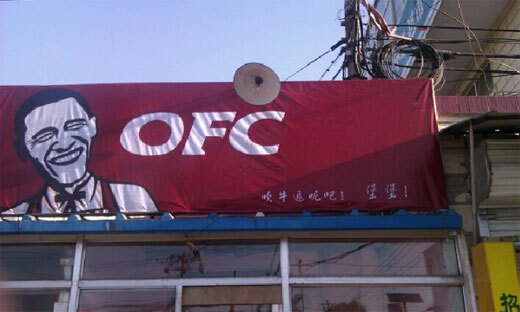 Back in October, this KFC ripoff in Beijing made itself an “OFC,” for “Obama Fried Chicken.” Probably not the best move when you’re infringing on major international copyrights. This drew enough attention that they ended up changing their name to “UFO.” Still using KFC colors, fonts and styles, still ripping off their menu — but now they’re taunting aliens instead of the U.S. The Vegas line would be *tight* on which one of those will attack China first. 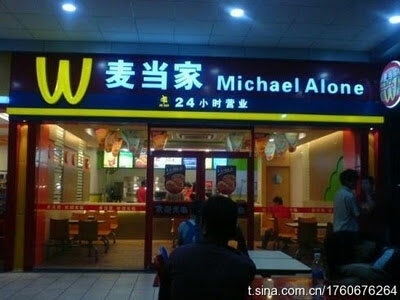 11 | But that’s not the only fake KFC in China.. 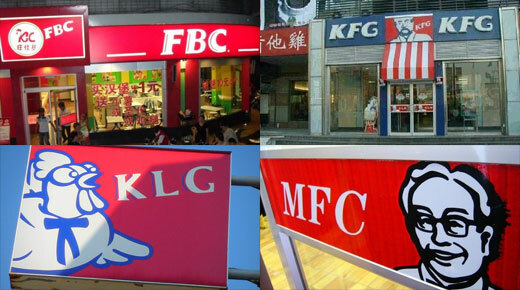 Here are four of the many others — FBC, KFG, KLG and MFC. Basically, they just threw any combo of three English letters at the wall and chose what stuck. It’s like when American teenagers get random Chinese character tattoos.